Location: Mallow, County Cork, Ireland. Ownership / Access: Cork County Council. Notes: Mallow Castle is a National Monument situated off the N72 on Bridewell Lane, Mallow, County Cork, Ireland. The fortified house dates from the 16th century and is believed to have been built by Sir Thomas Norreys before his death 1599. 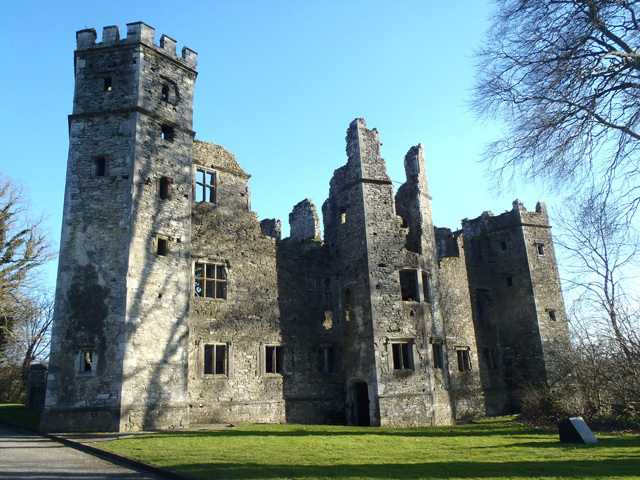 Following his death, his niece Elizabeth and her husband Sir John Jephson inherited the house, with their family remaining in Mallow for almost 400 years. It was placed under siege by Richard Butler, Lord Mountgarret, in 1642 during the Irish Confederate Wars and did not fall. It was captured in 1645 by James Tuchet, Lord Castlehaven. The house was badly damaged by fire during the Williamite War and subsequently abandoned by the Jephsons. The Jephsons built the new mansion house on the site of the older castle's stable block. The fortified house was made a National Monument in 1928. Commander Maurice Jephson sold the mansion to the McGinn family of Washington, D.C., in 1984. The castle and the grounds have been in the possession of Cork County Council since 2011.